The heavens above, the focus of all our attention. The Bible says they are stretched/spread out. What does that mean and is it in agreement with science? 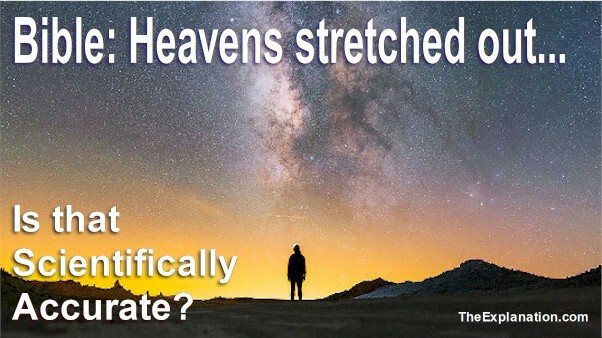 The Bible indicates the Heavens above were ‘stretched out.’ Is this a scientific statement or not? The heavens above extend for light years of light years in all directions. Both the Bible and Science talk about this mind-expanding vastness. In the context of Big Bang and cosmology do these two sources agree or disagree in both their knowledge, comprehension, and conclusions? Biblical Hebrew is very expressive. We have learned that the original language of the Bible describes the expansion of space. It includes the concept that space is occupied by matter in all directions. Amazingly, there’s also a ‘hissing’ which parallels the universal echo discovered by Penzias and Wilson in 1960. Big Bang and its results, the heavens above, are both scientific and biblical. In studying the Bible one realizes that there are multiple passages referring to the creation, where the heavens above originated. These passages, in their original language, shed light on various aspects that need to be considered in the scientific light. One such context highlighted for us is in the book of Isaiah. Thus says God the LORD, he that created the heavens above, and stretched them out; (H5186) he that spread forth the earth, and that which comes out of it; he that gives breath to the people upon it, and spirit to them that walk therein. What does ‘stretching out’ the heavens above mean? Is this like grabbing an elastic band and pulling it out? Or like a rubber sheet stretched out in one plane like a tablecloth? This is an image often used to describe the curve of space-time, a single plane with a dome shape in the middle. That would be our dictionary understanding of the this English translations ‘stretch’: ‘be made or be capable of being made longer or wider without tearing or breaking.’ In other words, only two dimensions: length and width. KJV – + afternoon, apply, bow (down, -ing), carry aside, decline, deliver, extend, go down, be gone, incline, intend, lay, let down, offer, outstretched, overthrown, pervert, pitch, prolong, put away, shew, spread (out), stretch (forth, out), take (aside), turn (aside, away), wrest, cause to yield. Since this whole concept of Biblical Hebrew and its usage is so new to 99.99% of readers of this blog I want you to notice that this one Biblical Hebrew word (נָטָה nâṭâh – H5186) used about 215 times in the Bible has over 25 different translations done by the KJV translators. Ask yourself the question: Why so many translations? Why such variety among the various translations? Read this for a lengthier answer. The short answer is this is ONE piece of the puzzle with 25+ ‘contours.’ It’s a uniquely shaped puzzle piece (as are ALL the other Biblical Hebrew words in the Bible). And this unique piece, with its various contours, must first, be understood, then second, be properly assembled with ALL the other pieces, with their various contours. Only then can we expect to get a true final image of what the Bible is telling us. Get ONE of these pieces out-of-place and you have to FORCE the other pieces. The result is everything is jumbled. You know that’s the case with a puzzle. This ‘putting pieces OUT of place’ is the reason you have so many interpretations of the Bible! Theologians and religions believe their own assembled puzzle is THE puzzle so they disagree with others and even go to war with one another. Religions believe their assembled puzzle doesn’t fit with Science’s assembled puzzle (their worldview of how the world became to be and is today) and they hotly debate with one another. Very sad, but that’s the reality. Notice one of the 25+ translations of the Hebrew root ‘natah’ = ‘pitch’. ‘Abram pitched (H5186) his tent…’ (Gen. 12:8)—this is the first appearance of the word in the Bible. We can use our imagination and envision that in those days, tents were ‘extended in every direction’, ‘stretched out’. The stitched-together animal skins were ‘spread out’. This act and its result are used as a representation of God creating the heavens above: ‘…which alone spreads out (H5186) the heavens…’ (Job 9:8). As we’ve seen, Big Bang shows the universe expanding and spreading in every direction. The Bible, by its use of precise vocabulary, indicates just that: ‘It is I (God) who made the earth and created mankind upon it. My own hands stretched out (H5186) the heavens above; I marshaled their starry hosts’ (Isa 45:12). This concept is different from the single-plane two-dimension image of an elastic band or a rubber sheet. Above, Strong refers to ‘bending away’; think of the spiraling motion of the astral bodies in their three-dimensional movement through space, which our audience is witnessing. Our audience thinks of camping and the parallel of setting up a tent. 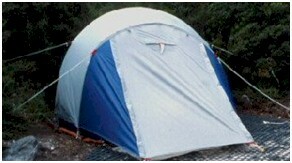 Although there are many different types of tents available on the market today, a camper knows the basic technique of stretching out the floor and securing it to the ground then, erecting poles on the inside to have open ‘space’ and finally, stretching cords from the tent top diagonally to the ground where they are anchored by pickets. Experienced campers strive for equal tension on each cord all the way around the tent. Thus, the tent, essentially the ‘space’ inside, is stably stretched/spread to its maximum, in three dimensions, with no slack spots. Likewise with the universe. Precise Biblical Hebrew revealing, according to the Bible, how God created ‘space’ and also a valid description of a stable ‘space’ spread-out in all directions. That’s heavens above. In Job 37.18 there’s another Hebrew verb for stretching out, Have you [Job] with him [God] spread out (H7554) the sky… this Biblical Hebrew word has added meanings (see Further Study below) that are both complementary and supplementary. Even with the insight brought by the tent image, we aren’t quite finished with Isaiah 40:22. It says God stretches out the heavens above like a ‘curtain’. The New International Version translates this: canopy … which I prefer, but what does the Biblical Hebrew tell us? 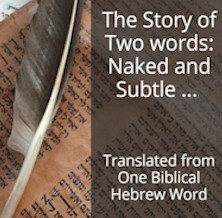 Again, using the Biblical Hebrew word tool at UnlockBibleMeaning.com, our Bible search reveals that this Biblical Hebrew word (curtain) is a one-time-only usage. Are we in for another treat that is impossible to discern from the translations? KJV – beat in pieces (small), bruise, make dust, (into) ⨯ powder, (be, very) small, stamp (small). Galacti and our audience grasp the implication immediately. The curtain-canopy that God spread out is composed of very small, fine pieces of dust or powder. UnlockBibleMeaning.com shows us a couple of verses that give this translation of the root, the most basic grammatical structure, and meaning, (H8154) of ‘curtain’ (H8152). Behold, I will make you a new sharp threshing instrument having teeth: you shalt thresh the mountains, and beat them small (1854), and shall make the hills as chaff. And when he had broken down the altars and the groves, and had beaten the graven images into powder (H1854), and cut down all the idols throughout all the land of Israel, he returned to Jerusalem. Wow. This reveals the composition of our curtain/canopy: beaten small powder. That is a rather enchanting way of expressing it, in view of our understanding of elementary and composite particles as explained in Inventory of the Universe. Another very similar reference to those ‘dancing, whirling sand particles fleeing from Big Bang’s central point we saw in blog 4 of this mini-series about Big Bang. It’s this ‘beaten small powder’ that was spewed out by the initial explosion. This is what makes up the composition of our overhead sky–curtain/canopy–which we see sprawling out through the vastness of space to the ever-accelerating edge of the Universe. The Bible reveals the nature–anatomy and constitution–of space. What became of this ‘fine matter’? Check out H4969 over at UnlockBibleMeaning.com Verify that it’s a one-time usage. Read Strong’s reference and mouseover below it. Click on ‘Hebrew Concordance for H4969’ In the left column only one reference will display. KJV – beat, make broad, spread abroad (forth, over, out, into plates), stamp, stretch. This word is also the basis for Gen 1.6-7 where God makes the firmament (H7549). Assuredly, one Hebrew word contains various aspects, many contours. Once again, this is the reason why the KJV translators were so right in choosing multiple English words to translate just one Hebrew word. Above I wrote this: Galacti and our audience grasp the implication immediately. The curtain-canopy that God spread out is composed of very small, fine pieces of dust or powder. I hope you realize that I composed that sentence to express the composition of space. However, ALL the VOCABULARY used is not at all from Sam Kneller. ALL those words (very small, fine pieces, dust, powder) are from Strong’s and the KJV translators. Check the vocabulary in the box above the sentence. Hundreds of years ago the KJV translators used simple but expressive vocabulary to describe the essence of how the universe came into being which true science has discovered in the last few decades. All I’m doing here is transmitting vocabulary used by Strong and the translators to give you the deeper meaning of the Biblical Hebrew. All the puzzle pieces for a complete puzzle picture are already on the table. Unfortunately, the efforts of theologians, philosophers, and scientists to put Humpty Dumpty’s pieces together have been disastrous and he looks more like Hunk Junk (yes, a theological and scientific hunk of junk) than ever before. I’m starting right at the beginning, Genesis 1.1 to lay the proper foundation … otherwise, we’ll just have another Hunk Junk. In a post 2 weeks ago I discussed sand particles. Today in Isaiah 40:22 we have ‘beaten fine powder.’ Different vocabulary but you can see the similitude between them. In addition, they both describe the same phenomenon: The composition of the heavens above and beyond in space, This is another Bible principle to keep in mind. Compare the two contexts to see the similarity of concepts in the context of cosmology. The vocabulary might be a ‘one-time’ usage but each idea (sand and powder) is complementary to the other. This is what I call ‘corroborative texts.’ these are two pieces of the puzzle assembled correctly. Two contours that marry together coherently. This is what we’re looking for, coherent completeness. Coherent completeness MUST take into consideration not only what a Sacred Book says but also what true Science (not speculative concepts and theories) tells us. Are you beginning to see the corroboration, not only between Bible contexts, but also between the Bible narrative and the Science narrative? There are many many more corroborative texts and much much more coherent completeness to come. Since you read all the way to here… you liked it. Please use the Social Network links just below to share this excerpt of Inventory of the Universe, Bible: The Heavens Above are Stretched Out. Is that Scientifically Accurate?